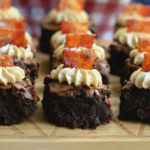 Today, I decided to share how I like to doctor up my cake mixes on those rare occasions that I do use them. 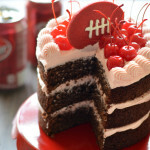 This cake is specifically made for tailgating and game-watching. 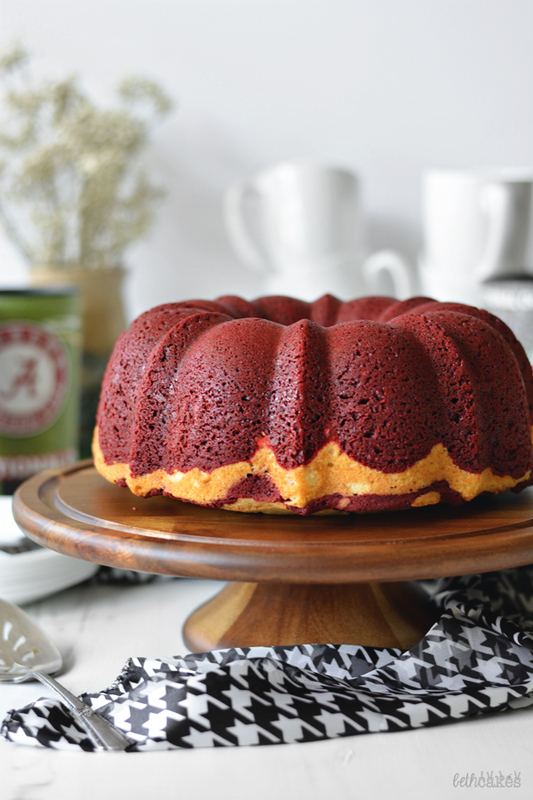 So if you’re cooking up a lot of food for the game, I think a cake mix could come in handy. I used red velvet and white cake mixes because those are my team colors, but you could just use white cake mix and whatever food colorings you want. My real goal for this cake was to get a nice swirl. 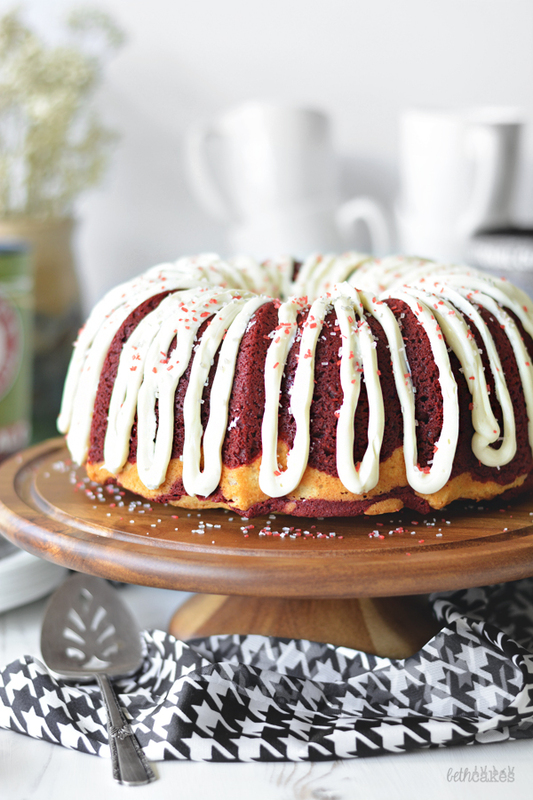 First I added a layer of red velvet cake batter to my bundt cake pan, and then topped it with white cake batter. The layers get repeated one more time, or until the pan is about 3/4 full. If you’re using two cake mixes like I did, you’ll probably have a little batter of each leftover. Then I used a long toothpick and went through the middle of the batter one time. That’s it! Came out perfectly swirly. I think if the batter had been thinner, I coulda squeezed some extra layers in there. 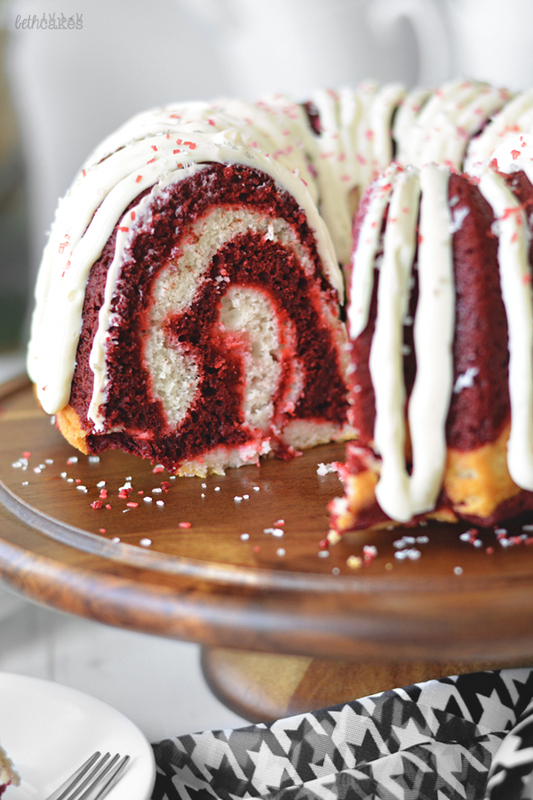 So if you’re looking for a cake that’s perfect for game day, try a marbled bundt cake! In addition to being easy to make, you don’t have to worry about frosting a layer cake. 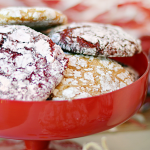 You can just drizzle some glaze or powdered sugar on top. It’s easier to serve than a layer cake too. 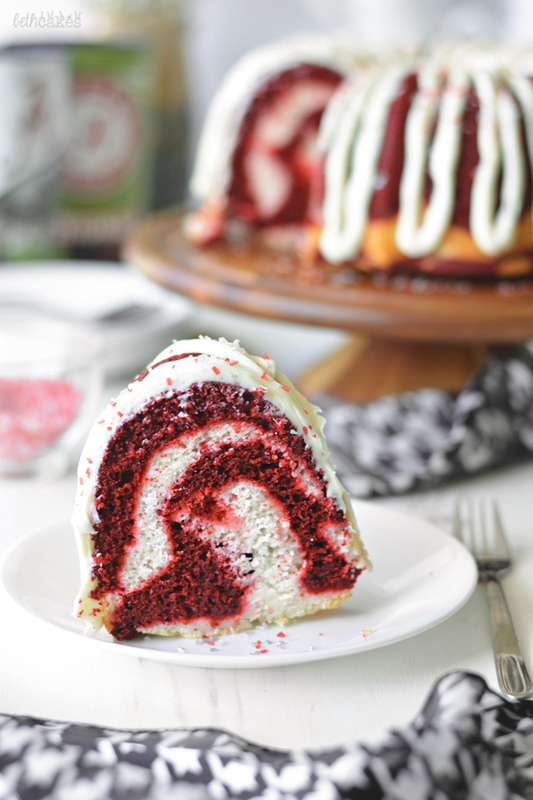 And lastly, I think if you’re travelling somewhere, whether it’s a college campus for a tailgate or a party at your friend’s house, transporting a bundt cake is a lot less nerve racking than transporting a layer cake, or even cupcakes. I’m just always afraid those things are going to fall over in my car. And I’ve definitely had frosting slide off a cake while in the car before. Speaking from experience here, people. 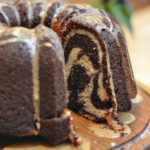 Go with the marble bundt cake! Preheat oven to 350 degrees and spray a bundt cake pan with cooking spray. In one bowl, beat butter on medium speed with an electric mixer until creamy and smooth. Add half of cake mix and buttermilk. Mix until incorporated. Add second half of cake mix, egg whites, and vanilla extract. Mix well. Set aside. In another bowl, beat butter on medium speed with an electric mixer until creamy and smooth. Add half of cake mix and buttermilk. Mix until incorporated. Add second half of cake mix and eggs. Mix well. Add a layer of red velvet cake batter to the prepared pan. Top it with a layer of white cake batter, using a spatula to spread it out evenly. 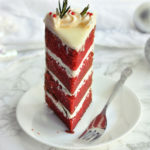 Repeat with another layer of red velvet and white cake batter. Insert a wooden pick into the batter and run through the center of the pan. Bake for 40-45 minutes, or until center of cake is set and a toothpick inserted in the middle comes out clean. 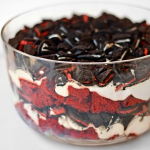 Let cool for 10-15 minutes, then turn out on a cake plate. Cool completely before frosting. Cream butter on medium speed until smooth. Add vanilla and powdered sugar. Mix on low speed until just combined, then on medium speed until completely combined and fluffy. Transfer frosting to a piping bag with a round decorating tip, and pipe frosting over cake. 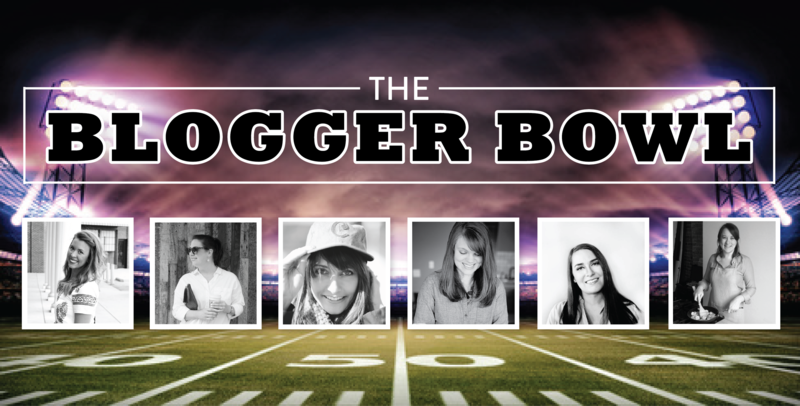 It’s finally College Football Season, and I’ve teamed up with a few other bloggers for The Blogger Bowl! We’ll be sharing everything from a great tailgate recipe to the perfect game day style throughout the fall. Keep up with our posts on social media using the hashtag #thebloggerbowl and check out our blogs, too! Awesome visual, wished I could taste test it for you. Oh, and ROLL TIDE! Beautiful cake. And it looks delicious! This looks amazing!! 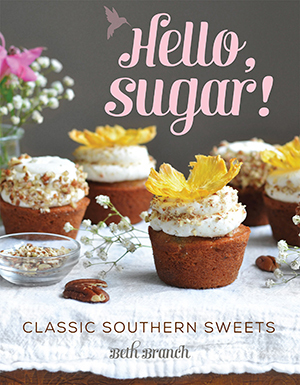 I’m totally with you – sometimes you just need to use a cake mix, and this is too pretty so it doesn’t even matter. Love it! This is just such a cool looking cake! 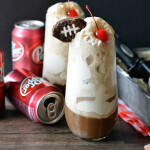 Definitely perfect for game day! I love this cake!! And I agree cake mix comes in handy sometimes.